Adobe Kroger has a secret. She is a Paladin – a holy knight blessed with the power to wield the divine Light of love and creation. Or she was, anyhow. After being convicted of blasphemy, she’s been excommunicated from the holy order and her power was taken away. Or so her superiors thought. Unbeknownst to them, despite their efforts, the Light is still hers to command. She would be in terrible danger if they were to discover the truth, but she is determined to use her power to rectify a terrible mistake, whatever the personal cost. When one night she encounters a mysterious evil creature the likes of which no Paladin or Wizard has ever seen, she becomes embroiled in a sinister conspiracy that holds the fate of the world in the balance. As if that weren’t enough, she also loses her phone. This modern day fantasy tale is told in Adobe’s own voice. Join the potty-mouthed Paladin as she confronts the terrors of an obnoxious speech impediment, an embarrassing viral video, a far more talented and handsome rival, a phantasmal dream-walking roommate, and a wizard armed with a cricket bat and a faulty memory. With all of that and being caught between her day job and former colleagues with murderous grudges, can she come to terms with her destiny in time to avert the destruction of the human race? 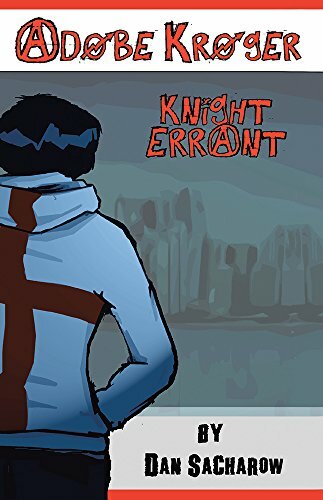 Adobe Kroger, Knight Errant is the first in a new series by Dan Sacharow, creator of the webcomic Molly Beans. Set in the recent past of 2013, this Urban Fantasy Adventure story can best be described as John McClane meets Black Widow set in an episode of Jack Bauer’s 24, with a skilled but moderately powered protagonist swept up in a non stop barrage of calamity, with little to rely on but her wits.